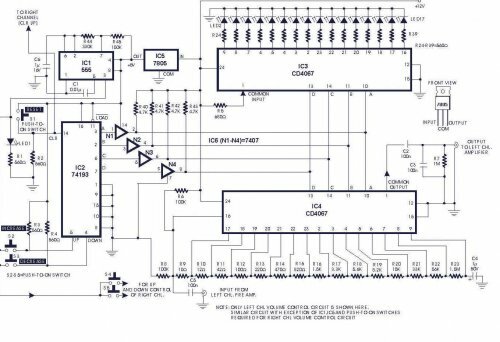 Circuit of a digital volume control using six discrete ICs, including a 5V regulator, is presented. IC1 (555) is configured to function as astable flip-flop. Its frequency or period may be adjusted by proper choice of resistors R44, R45 and capacitor C6 combination. Here it is for 0.3 second period. IC2 is a presetable up/down counter. In this circuit up-mode is used for increasing and down-mode is used for decreasing the volume. 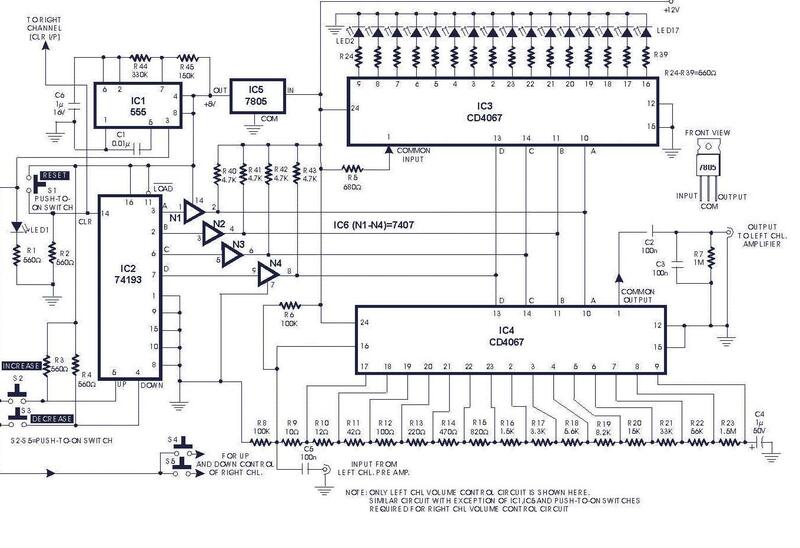 IC3 and IC4 are 16-channel analogue multiplexers which function as analogue switches. Here IC3 is used as level indicator while IC4 is used as a potentiometer. Soon after the power is switched on, switch S1 is to be pressed to reset the whole system. When switch S2 is pressed, IC2 counts up the number of pulses and the result is available in the form of BCD output. IC6 is used as an interface between TTL and CMOS ICs. The BCD output controls the address input lines of IC2 and IC3, and selects/switches one, out of sixteen channels, by turning on the appropriate analogue switch. In the circuit, IC4 is used as a potentiometer by connecting 15 resistors (R9 through R23) between each of its 16 input pins and a resistor/capacitor combination of C2, C3 and R7 at its output. The values of resistors R9 through R23 can, of course, be selected as desired. Here the resistors have been selected for a logarithmic scale. Switch S2 is used for increasing and switch S3 is used for decreasing the volume. Similarly, switches S4 and S5 are provided for second channel (right channel) volume control. Also, pin 14 of IC2 can be connected to IC 74193 pin 14 (clear input) of the right channel volume control circuit. The volume control circuit of right channel will be identical to that of the left channel circuit (shown here) except that IC1, IC5 and push-to-on switches are not to be duplicated. A 1uF electrolytic capacitor (C4) is used to prevent switching noise. Resistors R8 and R6 are used to fix the quiescent operating voltage level at half the supply voltage for avoiding distortion of the audio signal from the preamplifier. Capacitors C2, C3 and resistor R7 are provided for proper filtering of the audio and blocking DC component. An exact logarithmic scale of resistors R9 through R23 produces a pleasing and smooth control.